How will Nike’s purchase of Converse change the athletic shoe industry? Will the allure of the Chuck Taylor shoe be trashed by Nike’s takeover of Converse? Last week Nike bought troubled footwear brand Converse in a deal worth $305 million (£187 million). At first inspection it seems like a curious fit: on the one hand a long-established darling of the politically right-on worn with pride by fashionistas and rock stars alike while on the other, a relatively young and bullish corporation set on dominating the world market at almost any cost. When the announcement was made official, Tom Clarke, president of new business ventures at Nike referred to Converse as a “beloved brand”. Not perhaps something that Nike can aspire to. Although a large percentage of the population of the world must own a pair of Nike trainers, the company has witnessed a recent backlash in protest against its manufacturing processes and its relentless expansionist policies. Where Nike aggressively pushes new products in order to control the market, Converse has continued with the same basic range, varying only pattern and material and as a result have built an American icon which has indeed become “beloved” of many. 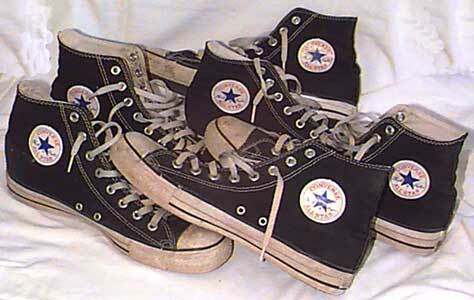 Founded in 1908, Converse is most famously the creator of the Chuck Taylor All Star shoe. While the brand has sought to branch out over the years with more updated products, it is consistently through the Chuck Taylor shoe that the company is recognised. While $75 is not cheap, it is not prohibitively expensive, reflecting the fact that the Chuck Taylor is intended as an affordable shoe for all. Indeed with a standard retail price of around £40 in the UK it has few equally priced fashionable competitors. The affordable price tag combined with the fact that the Chuck Taylor shoe is vegetarian-friendly — something it is becoming more and more difficult to find in the mainstream market — makes it a utilitarian product and ensures that it continues to appeal to its traditionally liberal audience. The ebay seller’s excitement is echoed by Hal Peterson, webmaster of chucksconnection.com — a virtual shrine to Converse’s Chuck Taylor All Star trainer — which has grown since its inception in 1998 and now offers a wealth of knowledge, information and photos on anything to do with the product. This notion of freedom is an interesting one especially when hitched on to the corporate bandwagon that is Nike. Being free to express yourself is not something that is readily associated with the Nike brand. Rather, the company’s swoosh logo has come to represent a type of conformity. There is no bold statement about freedom of expression or individual choice expressed in sporting a product of the world’s largest trainer producer. Nike may have introduced a build-your-own trainer facility to their website but retailing at a minimum of £90 per pair, this individuality comes at a price, making it seem more like exclusivity. Formed in 1971, Nike is now the world’s leading designer and marketer of athletic footwear, apparel, equipment and accessories. For the fiscal year 2003, the company’s revenue totalled $10.7 billion (£6.66 billion). However with their success has come bad publicity and the company now finds itself as one of the central hate figures in the anti-globalisation movement, criticised heavily for its manufacturing methods and targeted by pressure groups like the Boycott Nike movement. Equally the brand, as it seeks to increase its exposure, has come to symbolise much of what is wrong with modern consumer culture for a media-savvy youth familiar with Naomi Klein’s No Logo and the satirical magazine Adbusters. The deal with Nike is indicative of Converse’s recent acceptance of some harsh economic realities. Traditionally, Peterson explains, buying Converse represented a desire to “support American labour rather than Asian sweatshops”. However following financial difficulties which saw the company filing for bankruptcy in March 2001, the company has moved its manufacturing to Asia, thus sacrificing its “made in the USA” proclamation that had been stamped on its heal for over 80 years. As Peterson points out, under Nike’s control “the bad news is they will never move production back to the US&”. Dawn Mead, freelance fashion editor at Maxim expresses concern that the Converse brand runs the risk of being sullied by its association with Nike. Whereas Nike has to constantly re-invent itself, Converse, Mead explains, stays the same. The brand then has a sense of purity which is maintained by the fact that it hasn’t been over-advertised. As a result a whole range of people from the music industry to the fashion world enjoy wearing them. Famously, grunge figurehead Kurt Cobain was a fan of the brand. His preference seemed to be for the One Star model, the trainer he was wearing when he committed suicide in 1994. The market for trainers is a very lucrative one. Figures compiled by TNS Fashion Trak put the market value for sports footwear for 2003 in Great Britain alone at £1,827,289,000. However as Nike’s acquisition of Converse demonstrates, it is a market which is constantly developing. Another key development in recent years has been the growth of the retro or classic end of the footwear market. This section of the market has been growing over a number of years with classic brands like Adidas and Puma making tidy profits as a result. This is however an area that Nike has always struggled in given its relatively recent foundation. The acquisition of Converse opens up this market and allows Nike to reach back further than 1971. Tom Harrington, former senior vice president and director of marketing communications at Adidas explains that the Converse brand also allows Nike to target the big discounters like Wal-Mart. This is an area that Nike has previously not been associated with due to its highly protective pricing strategies designed to maintain the image of a prestige mark. A veteran of the sports retailing scene, Harrington explains that to ensure the success of the deal, it is essential that Nike should operate the Converse brand as a separate concern. Nike must continue to allow Converse to operate with freedom in its specialist sectors. A degree of independence is the key for as Hal Peterson points out, “The last thing that Converse chucks wearers want is to be told that their favourite shoes now come from a division of Nike.” Faithful followers can at least be assured by initial signs which suggest that Converse’s trademark star is not to be replaced by the Nike’s swoosh. Harsh financial reality it may be. But for some the pill may be just too bitter to swallow. www.mad.co.uk is a subscription online resource based in the UK for professionals working in the marketing media, new media, advertising and design industries. Click on the link to check out their website.